The US Coast Guard can trace its history back to 1790, when the First Congress authorized the construction of ten vessels to enforce tariff and trade laws, preventing smuggling, and to protect the collection of the federal revenue. Known variously as the Revenue Marine and the Revenue Cutter Service, it expanded and added responsibilities including humanitarian duties such as aiding mariners in distress. It is also the United States Coast Guards job to protect the marine environment, help explore and police Alaska, and chart the nations coastlines. The US Coast Guard received its current name in 1915 under an act of Congress. Until the Navy Department was established in 1798, it served as the only armed forces afloat for the United States. In times of peace, it operates as part of the Department of Homeland Security, serving as the nation's front-line agency for enforcing America's laws at sea, protecting its coastline and ports, and saving lives. IN times of war, or upon direction of the President of the United States, it serves under the department of the Navy. 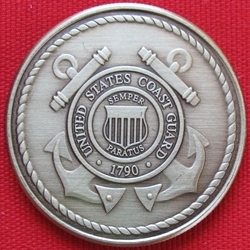 This coin honors the commitment of the United States Coast Guard to protecting America's freedom and keeping it safe by enforcing its laws and supporting its mariners.